One of the most fun things about searching for vintage illustrations to add to Reusable Art is when I discover a wonderful artist with whom I am unfamiliar with. This week brought one such discovery, Ida Waugh. Her specialty? Wonderful portraits and illustrations of young children and infants. Waugh died in 1919. What’s less clear was when she was born. A few listed her birth as having occurred in 1819. Logically, that seemed unlikely to me. Another source confirmed my suspicions. They had biographical information about the artist Samuel Bell Waugh, Ida’s father, and listed his year of birth as 1814 – which would place him having Ida when he was only 5 if her date of birth really were 1819. The Kemp Gallery’s website said that Samuel traveled Europe for eight years, visiting France, Italy and England. His specialty was portraits. He painted portraits of both Abraham Lincoln and Ulysses S. Grant. It makes sense then that Samuel’s daughter Ida would also become a talented portrait artist. Much of her training came at his hands and she also was trained at the Pennsylvania Academy and at the Academie Julian in Paris. 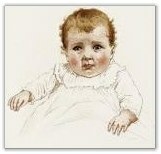 Her’s were the first drawings and illustrations of infants and babies that I have found that have fallen into the public domain since starting Reusable Art. They are so charming and I betcha at least one will make you say “ah”. The new Infants & Baby Pictures category currently has a dozen of her beautiful pictures. The three below are my favorites. Ida Waugh lived with her lifelong companion, Amy Blanchard, for 55 years. Amy was an author of children’s books and she worked with Ida to publish 19 wonderfully illustrated books. I have already added a variety of illustrations from several of their books to Reusable Art and plan on adding more as I find them. Recycled Arts & Crafts Arrives at Craft Tips! This entry was posted in Great Websites, Reusable Art and tagged Artist Profiles, Great Websites, Reusable Art. Bookmark the permalink. Previous Post - Are you practicing negative SEO on yourself? One great artist, a dozen beautiful babies and a whole lotta awwww. A great find of vintage art that everyone can enjoy. Even if you’re not looking for great copyright free images, these cute babies will bring a whole lotta cute into your day. Ida Waugh may have created these illustrations almost 100 years ago but they could as easily been drawn yesterday.